Today, August 22, used to be celebrated as the feast day of the Immaculate Heart of Mary. This celebration was instituted when Pope Pius XII consecrated the whole world to the Immaculate Heart of Mary on October 31, 1942. This was done in response to the petition of Our Lady of Fatima. In 1969, the feast day was moved to the Saturday after the Solemnity of the Sacred Heart of Jesus. August 22 is now the day that the Catholic Church celebrates the Queenship of Mary. The day of celebration of the Queenship of Mary was originally the 31st of May. This Marian feast was instituted on October 11, 1954 by Pope Pius XII in the encyclical Ad Caeli Reginam. 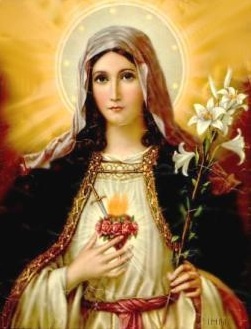 His intent was that this would be a day when the Church would re-consecrate the world to the Immaculate Heart of Mary so that "a new era may begin, joyous in Christian peace and in the triumph of religion." He was clearly concerned with the spread of "many great moral evils" and sought the intercession of Mother Mary to combat these threats. One may presume that Pius XII had in mind the Cold War and the threat of the spread of communism. And while communism has mostly been defeated since that time, the spread of atheism continues under the guise of secularism. This is the new "moral evil" that young people of today face and which Pope Benedict XVI has dedicated his Pontificate to battle. From the earliest ages of the catholic church a Christian people, whether in time of triumph or more especially in time of crisis, has addressed prayers of petition and hymns of praise and veneration to the Queen of Heaven. Following upon the frightful calamities which before Our very eyes have reduced flourishing cities, towns, and villages to ruins, We see to Our sorrow that many great moral evils are being spread abroad in what may be described as a violent flood. Occasionally We behold justice giving way; and, on the one hand and the other, the victory of the powers of corruption. The threat of this fearful crisis fills Us with a great anguish, and so with confidence We have recourse to Mary Our Queen, making known to her those sentiments of filial reverence which are not Ours alone, but which belong to all those who glory in the name of Christian. [St. Jerome] makes the following statement amidst various interpretations of Mary's name: "We should realize that Mary means Lady in the Syrian Language." After him St. Chrysologus says the same thing more explicitly in these words: "The Hebrew word 'Mary' means 'Domina.' The Angel therefore addresses her as 'Lady' to preclude all servile fear in the Lord's Mother, who was born and was called 'Lady' by the authority and command of her own Son." St. Alphonsus Ligouri, in collecting the testimony of past ages, writes these words with evident devotion: "Because the virgin Mary was raised to such a lofty dignity as to be the mother of the King of kings, it is deservedly and by every right that the Church has honored her with the title of 'Queen'." Art which is based upon Christian principles and is animated by their spirit as something faithfully interpreting the sincere and freely expressed devotion of the faithful, has since the Council of Ephesus portrayed Mary as Queen and Empress seated upon a royal throne adorned with royal insignia, crowned with the royal diadem and surrounded by the host of angels and saints in heaven, and ruling not only over nature and its powers but also over the machinations of Satan. In order to understand better this sublime dignity of the Mother of God over all creatures let us recall that the holy Mother of God was, at the very moment of her Immaculate Conception, so filled with grace as to surpass the grace of all the Saints. Wherefore, as Our Predecessor of happy memory, Pius IX wrote, God "showered her with heavenly gifts and graces from the treasury of His divinity so far beyond what He gave to all the angels and saints that she was ever free from the least stain of sin; she is so beautiful and perfect, and possesses such fullness of innocence and holiness, that under God a greater could not be dreamed, and only God can comprehend the marvel." Let all Christians, therefore, glory in being subjects of the Virgin Mother of God, who, while wielding royal power, is on fire with a mother's love. Since we are convinced, after long and serious reflection, that great good will accrue to the Church if this solidly established truth shines forth more clearly to all, like a luminous lamp raised aloft, by Our Apostolic authority We decree and establish the feast of Mary's Queenship, which is to be celebrated every year in the whole world on the 31st of May. We likewise ordain that on the same day the consecration of the human race to the Immaculate Heart of the Blessed Virgin Mary be renewed, cherishing the hope that through such consecration a new era may begin, joyous in Christian peace and in the triumph of religion. [Let all] strive to free themselves from the slavery of sin and offer an unceasing homage, filled with filial loyalty, to their Queenly Mother. Let her churches be thronged by the faithful, her feast-days honored; may the beads of the Rosary be in the hands of all; may Christians gather, in small numbers and large, to sing her praises in churches, in homes, in hospitals, in prisons. May Mary's name be held in highest reverence, a name sweeter than honey and more precious than jewels; may none utter blasphemous words, the sign of a defiled soul, against that name graced with such dignity and revered for its motherly goodness; let no one be so bold as to speak a syllable which lacks the respect due to her name. Thus will it come about that all Christians, in honoring and imitating their sublime Queen and Mother, will realize they are truly brothers, and with all envy and avarice thrust aside, will promote love among classes, respect the rights of the weak, cherish peace. No one should think himself a son of Mary, worthy of being received under her powerful protection, unless, like her, he is just, gentle and pure, and shows a sincere desire for true brotherhood, not harming or injuring but rather helping and comforting others. In some countries of the world there are people who are unjustly persecuted for professing their Christian faith and who are deprived of their divine and human rights to freedom; up till now reasonable demands and repeated protests have availed nothing to remove these evils. May the powerful Queen of creation, whose radiant glance banishes storms and tempests and brings back cloudless skies, look upon these her innocent and tormented children with eyes of mercy; may the Virgin, who is able to subdue violence beneath her foot, grant to them that they may soon enjoy the rightful freedom to practice their religion openly, so that, while serving the cause of the Gospel, they may also contribute to the strength and progress of nations by their harmonious cooperation, by the practice of extraordinary virtues which are a glowing example in the midst of bitter trials. It's a sign of the times that Marian feast days are mostly ignored here in the United States. When true Marian devotion takes hold in our country, then we will know that we have turned the ocean liner sized institution of the Church around and are headed back in the direction that God showed us when He sacrificed His only begotten Son for our sins. The celebration of World Youth Day in Madrid is over. Now begins the challenge of nurturing the seeds that were planted there, so that many years from now we can see the abundant harvest. Heart of Mary, seat of mercy. O most merciful God, Who for the salvation of sinners and the refuge of the miserable, was pleased that the Most Pure Heart of Mary should be most like in charity and pity to the Divine Heart of Your Son, Jesus Christ, grant that we who commemorate this sweet and loving Heart may, by the merits and intercession of the same Blessed Virgin, merit to be found like to the Heart of Jesus, through the same Christ Our Lord. Amen.